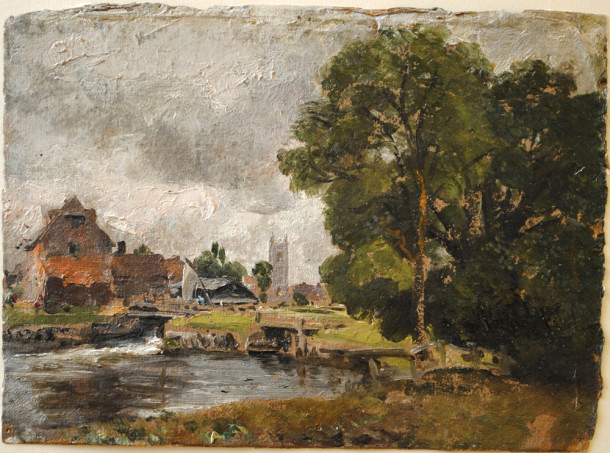 Constable, Dedham Lock and Mill, 1811, courtesy VAM. John Constable (1776-1837) was one of the pioneers of plein-air oil painting in England. He became convinced around 1802 that he should paint in oil outdoors, believing that Claude Lorrain had done so, even though Claude actually used only water-based media or drawing tools in his outdoor work. 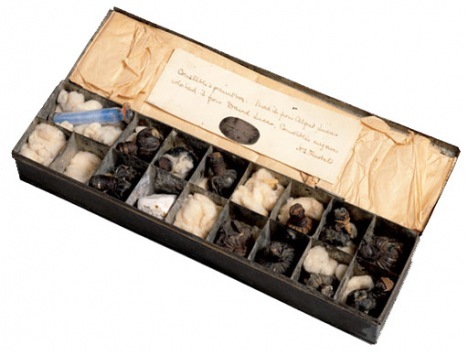 Here is one of Constable's surviving oil sketch boxes. The glass vials were a way to carry medium and pigment, as tubed paint didn't come along until 1841. Another way to carry mixed paint was the urine bladders from pigs or other animals, something you could pick up from a butcher. One of Constable's wooden sketching boxes, 9.25 x 12 inches. 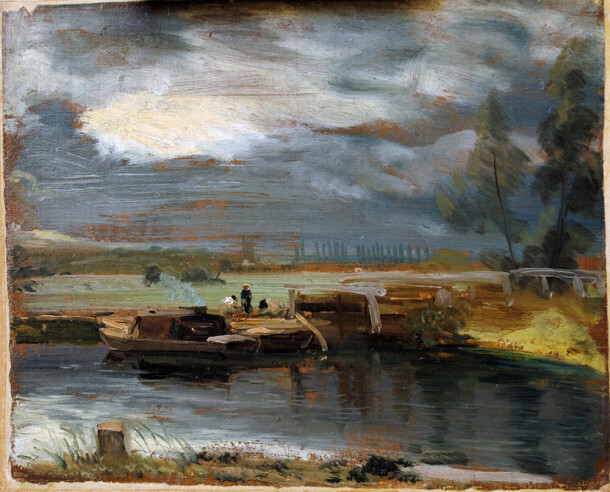 According to an exhibition catalog of his oil sketches, this paint box "shows the removable panel that fits into the lid, creating a separate compartment, that Constable used for carrying small pieces of paper, canvas and board. Wet sketches were piled in here on the homeward journey. The panel could also be used as an impromptu palette or as a flat surface for standing bottles of oil, turpentine, and other materials during painting." I don't know if I would agree with the authors that wet sketches were "piled in" to such a box. My guess is that Constable would have used a box like this open in his lap with the lid away from him as he sat on a tripod stool. The sketch would be pinned into the open lid, and kept pinned there until it was dry enough to handle. This was how Americans, such as Thomas Cole, Albert Bierstadt, and William Trost Richards did it. 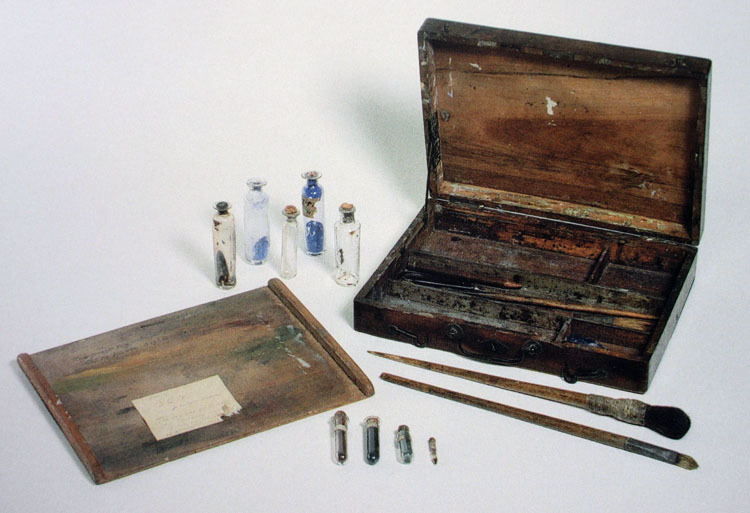 Here's another paint box, divided into "seventeen compartments and contains a cork-stopped glass phial with blue pigment, a lump of white gypsum probably used for a variety of purposes including drawing and roughening paper, and various bladders with the artist’s own or commercial ready-mixed paint." Try getting this one through the TSA. The priming, prepared in batches in advance of his painting sessions, saturated and sealed the sheets. I couldn't tell from my research whether he sized his surfaces before applying the oil ground. Later painters typically sized (or sealed) the paper or board with shellac or rabbit skin glue. By the 1820s, Constable was using commercially-prepared millboard or "Academy board," which was specially made for artists. One of his surviving plein-air palettes was analyzed for paint ingredients, including vermilion, emerald green, chrome yellow, cobalt blue, lead white and madder, ground in a variety of mediums such as linseed oil mixed with pine resin. At times it can be hard to tell whether a given sketch was done entirely on location or whether he touched them up after returning to the studio. Chemical sleuths have found that some sketches contain slow-drying mediums, such as poppy oil, which would have allowed him to rework his surfaces over extended periods of time, but that doesn't prove anything. To my eye, based on the efficiency and urgency of the paint handling, the ones shown in this post look to be done entirely on location. 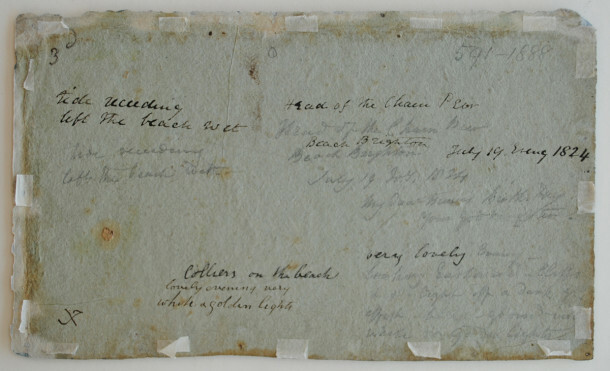 Constable often jotted notes on the back of his paper or boards. For example: "Very lovely evening—looking Eastward—cliffs (and) light off a dark grey sky –effect-background-very white and golden light." The Painted Sketch: American Impressions From Nature, 1830-1880 . 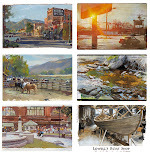 Well researched exhibition catalog which focuses on American plein-air practices. 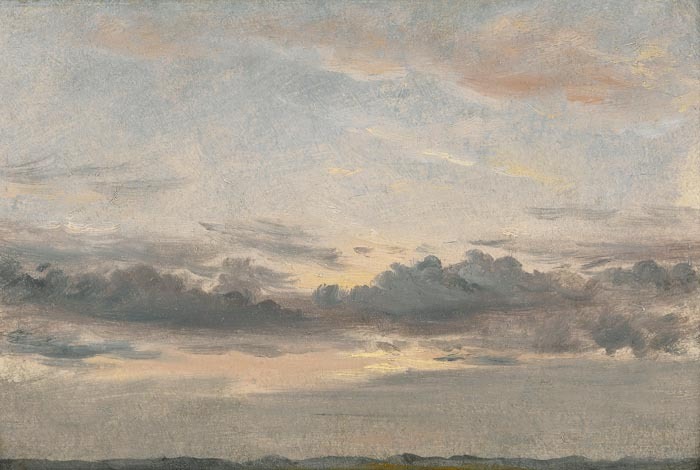 Lines and Colors Blog "Constable's Oil Sketches"
Fascinating! 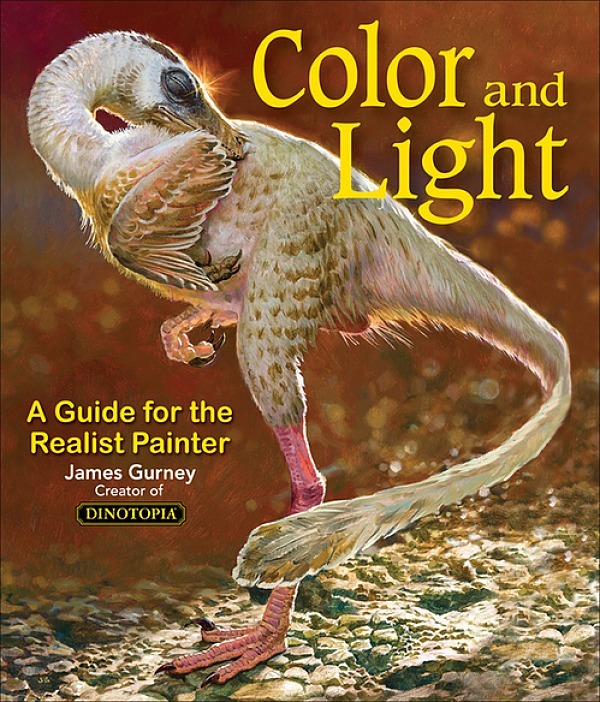 I love looking at painter's materials. Last week my wife and I went to the Gary Melcher studio and gallery in Stafford, Virginia. In his studio they had glass cases of his painting materials, paint-boxes, tools and some old sketchbooks. It was really fascinating. We did the tour of his house and my wife pointed out on a table near his bed (roped off) there was a little tin watercolor box and another tin box which had brushes and tools and stuff. I don't know if it was his or his wife's but I was excited to see it. I don't know if you and Jeanette have been but it was really neat. It's not very big, by itself, but worth the trip if you hit the galleries in DC along the way. "I don't know if I would agree with the authors that wet sketches were "piled in" to such a box. My guess is that Constable would have used a box like this open in his lap with the lid away from him as he sat on a tripod stool. The sketch would be pinned into the open lid, and kept pinned there until it was dry enough to handle." I haven't painted plein air, though I have a suitable box for converting, and issues like this sometimes spring to mind. 'Piling in' does seem to invite a bit of smudging and smearing; although, if the sketch was pinned into the lid, does that mean that outdoor excursions would have been a 'one board, one scene, one sketch' affair? Or were multiple sketches carried another way? Warren, there are various ways to deal with wet paintings, and they're all easier if the painting is done on a stiff board, rather than flexible paper. One is spacers set around the outside edge between multiple paintings. Another is a slotted drying box, and another is carrying the wet painting face-out in the easel's holder. That last one risks smudging the painting on something while you're carrying the rig. There are stories of artists of the past stacking still-wet paintings that stuck together. Sanford Gifford lost several weeks' worth of European studies by doing that. Jared, we haven't seen Melcher's studio yet. Thanks for that —sounds very interesting. James, This post was so timely. I was scheduled to teach "The Haywain" in one of my Art History survey classes this morning, and I showed the students your blog site in class! Thanks, Mr. Gurney! Currently pondering suitable makeshift spacers. Thank you for the Sanford Gifford reference too - some lovely things are appearing in a google image search. The priming recipe was a little vague. Was there more information from your source? I always wondered what historic oil painters used when they worked on paper. Bierstadt, for instance, his work on paper seems to have held up well? I've used matte medium as well, but I never really liked its tooth. Shellac I like, but I've been told by art conservators that it is not really stable. Stephan, I agree that the info was not complete. I wish the authors of the book I was getting this info from were more specific. I'll try to find out more from some museum conservators. When working in oil on paper or cardboard, I generally prepare the surface in two steps: a sizing (to soak into the paper texture and to seal it from the invasion of the oil and solvents); and a ground (which is often textured, colored, and in oil). I like painting on oil grounds rather than gesso because of the way the paint "floats" on the surface when it's wet. Maybe one of your wonderful well researched posts on historic grounds used on paper(hint, wink). I'm always curious about this subject because my earliest educations that one can not paint oils on paper, when in fact this was quite a common practice historically. Its light weight of course makes paper a great substrate when you're traveling. What an interesting post, thank you for sharing it. I think sometimes the sketches were piled up when not completely dry because I heard a talk at the V&A in London where it was said that the sequence of some sketches can be established by the marks on the back of pictures which had been piled on one another. Perhaps just on very productive days! Thank you for this fascinating post! I do know from a talk at the V&A in London that a few of of the small "lid of the box" oil sketches from the 1820s can be sequenced by the distinctive smudges of paint on the back, from being in a pile. So perhaps on very productive days he was painting faster than they could dry? Interesting blog. Thanks for sharing information with us.